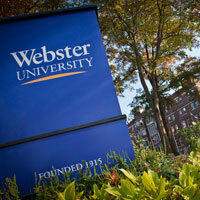 Three Webster University online programs were ranked among the best in the country, U.S. News & World Report said today. The rankings will be published as part of the “Best Graduate Schools 2019” and “Best Colleges 2019” guidebooks later this year. Webster University was listed among the best online MBA programs, best online non-MBA business programs and best online graduate education programs. Webster was ranked 222nd out of 311 institutions for online graduate education programs. Webster was ranked in the 215th-285th range out of 302 institutions for online MBA programs. Webster was ranked in the 114th-150th range out of 156 institutions for online graduate Business (non-MBA) programs. According to U.S. News & World Report, the rankings are determined through student surveys and data collected from the institutions in 2018. The ranking service looks at engagement, student excellence, expert opinion, faculty credentials and training, and student services and technologies.to calculate the final ranking. The complete rankings can be found online at www.usnews.com/online.